"With all the violence in [Mexico] right now, I sure as heck wouldn't be taking my entire family into a country like that willingly. Seems like an unnecessary risk just to visit other countries. " "Things keep getting worse all across Mexico and further south. Maybe it’s [the] lawlessness of the land?" These were just a couple of the comments we received before crossing into Mexico. My own mother (love you mom) even shed a few tears when I talked to her last before crossing the border. "Be safe," she pleaded. But what can you expect? What can be believed, when the only information available is from the media, and there's no personal, hands-on experience of what's really going on? From what other basis can you form your opinions? We'd had enough previous travel experience to surmise that most of the 'bad press' about Mexico was probably just that - bad press. Overhyped. Inaccurate. Out of context. We figured we would be safe, but still we were uncertain of what to expect. WAS Mexico more dangerous now than our previous trip in 2007? Was there more violence and crime? Were the banditos holding the country hostage with their drug wars, and the average citizen living in fear for their safety? Was it a 'lawless' country? What we discovered was a Mexico so far from the 'lawless', dangerous, deadly place U.S. media claims it to be, it's almost laughable, if it wasn't so shameful. "Yes, yes, Mexico is so dangerous isn't it? Ha ha, we're afraid for our lives," we mock as we bask in the sun on a beautiful beach, or kayak on a tranquil laguna, or saunter around the centro at night, as old men and women sit on benches, and children play beneath the light of street lamps. Better get your guns, boy. Mexico is dangerous. That's exactly what's shameful about it. Someone (I don't know who) has decided that a few dreadful acts, somewhere, has deemed this entire, beautiful, magnificent, amazing, awesome, wondrous, rich country a lawless, murderous, savage, perilous place that you should NEVER, never visit. ESPECIALLY not with children. The TRUTH about Mexico, is that it's more incredible than I previously knew. And I already knew it was awesome. It has so much history and culture, to rival that of Europe or Asia (okay, I've never been to Europe, or most of Asia, but I can only imagine). The food is, well...delicious (although sometimes fattening). And the people? Well the people are good. Kind. Generous. Helpful. Friendly. In fact, quite the opposite. From our first truck malfunction, to explorations in Mexico City, to our 'saga' in Sabancuy, people have gone out of their way to help, above and beyond the call of duty. Yes, we faced plenty of problems while in Mexico, and I experienced the 'war' going on here. But dangerous? Fear for our safety (not to mention our lives)? Never. My kids walk to the grocery store by themselves. They sell orange juice on the corner. There's no danger here. Yes, yes, somewhere, I'm sure there is some danger. There's danger somewhere in your home town or city, right? You could find it...if you went looking for it. But that's the point. You have to go looking for it. Most of the time, it won't come looking for you. Mexico has culture. Lots of it. Often when you think of a 'cultural' Latin country, you thin of Peru, or Guatemala. But honestly, Mexico can hang. It has lots of culture. From the diversity of people; the multiplicity of languages (over 50 spoken - with Spanish as the official); the architecture; the ruins; the festivals and traditions; the variety in food (not just tacos and burritos); the museums and theaters; libraries and universities. If you want culture, go to Mexico. 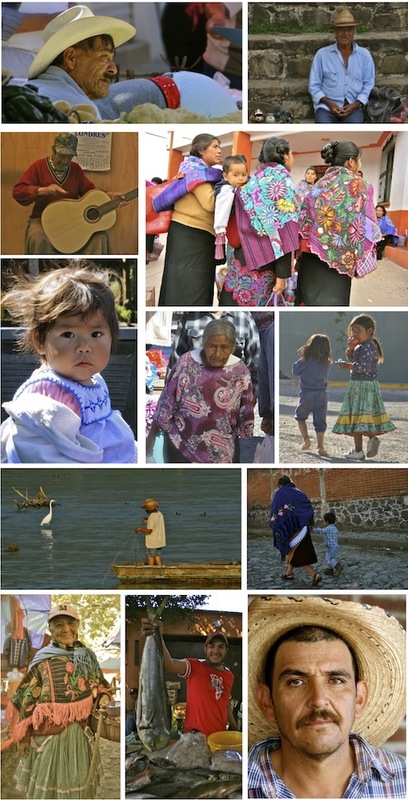 The people of Mexico are quite wonderful - and diverse. No, there are not just 'Mexicans' living here. There are also Mayans, Purapechans, Guatemalans, Argentines, Americans and countless other expats (over 1 million expats total). Are there banditos and drug lords? I guess. Somewhere. But no one we met or talked to knew anything about them (and we drove from north to south). The people we met were helpful and friendly, simple and happy. 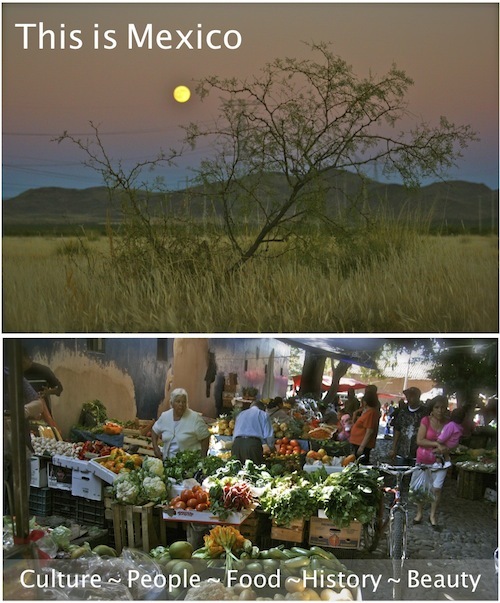 There is a diverse socioeconomic range - from wealthy, educated professionals that live in Mexico City and travel to their second home in Valle de Bravo on the weekends; to humble farmers that sell their harvest at the local markets; to the average family who runs a shop out of their home (whether that's tools, or chicken or tortillas). People in Mexico are not 'poor', as many Americans may believe- despite their 'run down' homes, simple clothing and furnishings. Instead, they are living within their means. They live in a house that they built themselves - paid for in cash. They buy the clothes they can afford to buy, the car the can pay cash for, and furnish their homes with what they can (or are willing to) bear the expense of (sometimes only a hammock). This isn't poverty. It's frugality. It's financial solvency. It's an example to be followed. Many families run their businesses out of their homes - selling food, providing some service, or even a store selling groceries, produce or goods. They love music, and when it comes to partying, it lasts all night long. I think it must be some badge of dishonor to have a party that doesn't last all night - no matter the age. Teens and 50 year old grandmothers can party like you've never seen. 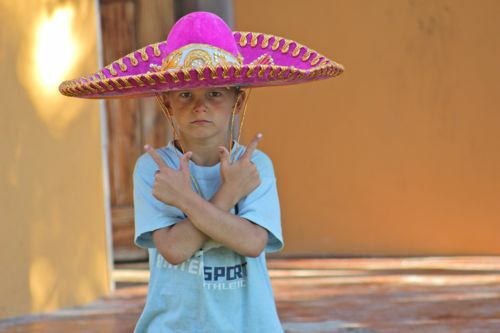 Are Mexican people perfect? No, of course not. No people are. But the key is to learn from the 'bad' and the 'good', and make yourself the better for the observations. 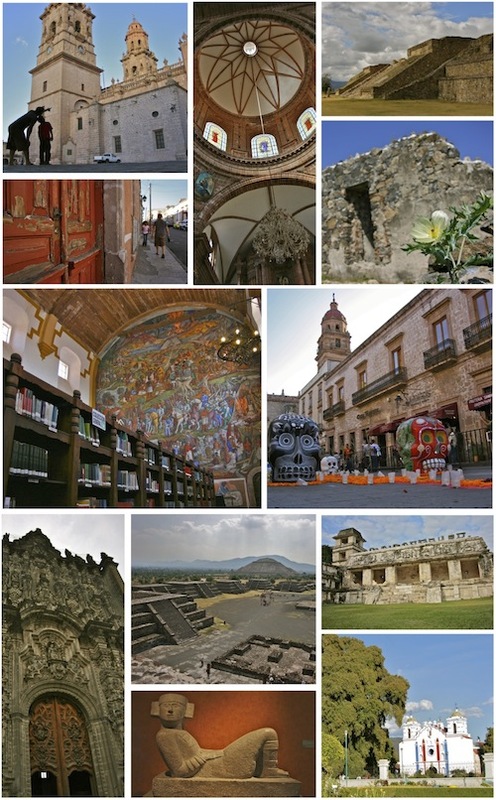 Mexico has a deep, rich history. 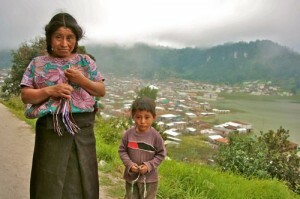 Like when we visited the incredible indigenous village on the road from Tuxtla to San Cristobal, in Chiapas. Here were a group of native Indian people who maintained their language, dress and customs. Yet smack dab in the middle of their town (like every other 'real' Latin town) was a catholic cathedral - a large, looming example of the powerful influence of the Spanish conquest. And as for beauty, I think Mexico must 'have it all'. 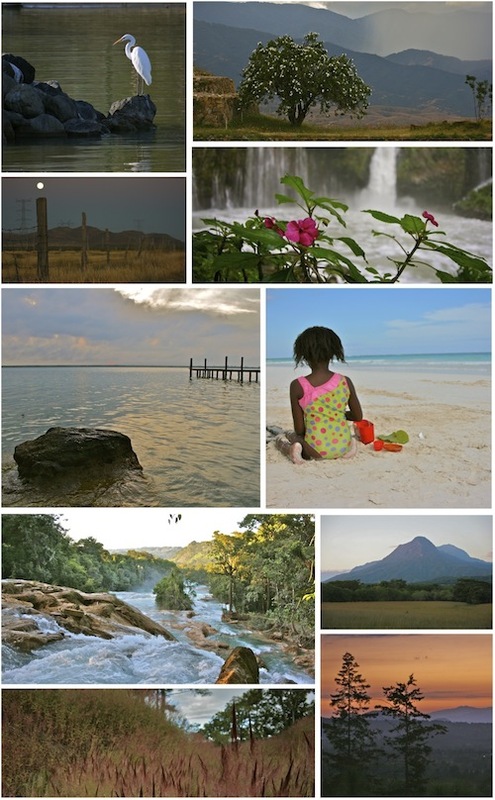 From tranquil pine forests, to majestic (and cold) mountains; exquisite beaches; farms and fields; rainforests and jungles; lakes and rivers and waterfalls and oceans. There is no lack of diversity in Mexico. Food is good in Mexico. Really good. Fatteningly good. Not just because it's fattening (some of it is), but because you'll want to eat a lot of it. Yes, there's the tacos and the burritos (although they won't be anything like you'll find at Taco Bell, and in fact each state has their own taco or burritos), but there's also pozole and empanadas and tamales (REAL, authentic style). 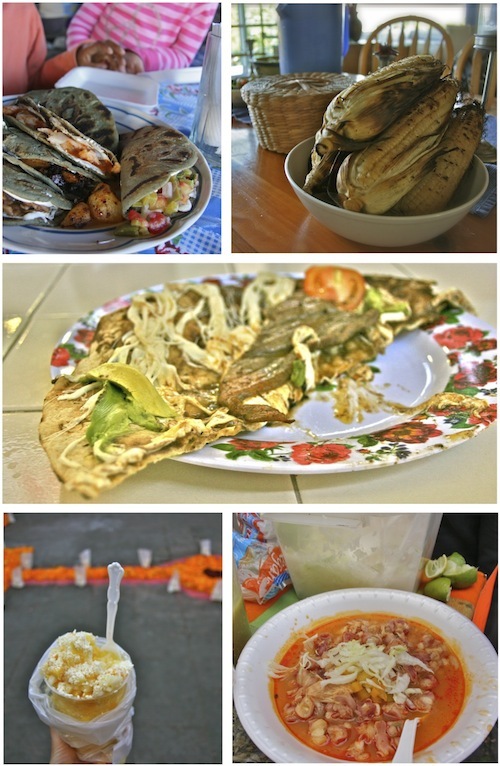 There's tortas and tlyudas, and tortillas de nopal, and the gazpacho, and quesadillas like you've NEVER seen before. Then there's fresh squeezed orange juice, and papaya and pineapple and mangoes and mandarinas and all the produce you want for super cheap. One reason the food is so good is that it made from scratch, with real, fresh ingredients. Oh, there's starting to be a change in all that. You're seeing more and more of the processed, packaged foods. And their processed foods are not 'health conscious.' (I don't think that movement has caught on yet in Mexico). White flours and white rice. High-fructose corn syrup. Sugar or artificial sweetener in everything. Lots of junk. Like the milk. 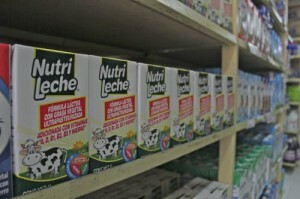 We haven't found any 'real' milk in Mexico...you know, the kind that comes in a jug and is refrigerated (or better yet, raw). And they use oil when they cook. A lot of oil. But, from personal experience, I think that also comes from doing most of their cooking on a stove top. You use more oil when you're cooking on a stove as opposed to an oven. But when you're talking about the local, traditional foods - the tamales and tacos and local specialties - made from fresh produce and locally raised animals. Oooh, that's good. That's really good. It's possible to live in Mexico for very inexpensively. It's also possible to live very expensively in Mexico also. 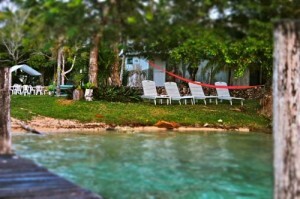 You could rent a room for US$200 a month, a beautiful, rustic, home for US$350, or a brand new place for US$2000. It all depends on what you're looking for, and what sort of lifestyle you want. 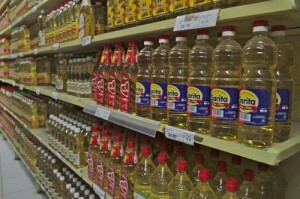 Imported foods are of course more expensive. Cereals will cost you between US$5-7 a box (we don't buy cereal). Peanut butter is about US$3.70 for a small jar. And if you want all-natural, organic, no sugar added peanut butter - the kind that my husband has an addiction to - good luck finding it. But if you do find it (like we just recently did in Chetumal), it's about $6.70 a jar. Cost of living comes down to what your lifestyle is about. If you want to live on fresh fruits and vegetables, and local foods, and in simple accommodations, you'll live inexpensively. If you'll be continuing your diet from 'home', with imported foods, and living in a pricey expat neighborhood, you'll spend a lot more. It's all up to you. I don't have the slightest hesitation in recommending it as a destination for travel, vacation, retirement or raising your children. I love your “they aren’t poor they are just living within their means” comment. It is so true. Rich doesn’t come from having the right house or a fancy car. It comes from focusing on relationships, family and experiences and keeping clear of debt. Living debt free gives you peace of mind that makes you rich beyond comparison. So jealous of your prices though – I just paid $7.29 for a gallon of milk and $6.99 for a bag of corn chips! Time to go 🙂 So we’re off. Yes, so true – focusing on what matters. Viva Mexico! We just got back from Baja, and love Mexico. We’ve been there five times in the last six years, with all of our kids. I’ve gone twice while pregnant… obviously we’ve felt very safe and well taken care of. There is so much to love, and thank you for taking the time to write about it. It’s a place near and dear to me; I’ve been going since I was a baby. I love how family is so important there; three of my cousins (along with spouses and children) still live with my aunt there in the home built by my great grandparents. I love that! I had the tampon dilemma there recently too; tons of pads but tampons were hard to find. I have been able to buy refrigerated milk there too… maybe just not in all areas? And my husband got to drink raw milk warm from the cow while visiting coffee plantations with a Mexican friend a few years ago. 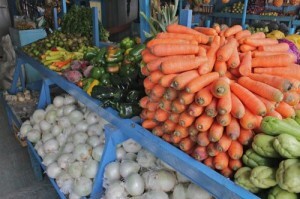 :> I was excited last year to find a great Farmer’s Market in La Cruz de Hauanaxatle that sold organic produce, fresh peanut butter, coconut oil, etc. I think the “real” food is there for the finding but it takes a bit of work to find it! I’m sharing this article with a friend too. Thanks for advocating the “real” Mexico! Awesome, thanks Rebecca for sharing your insights. When I traveled through Peru and Ecuador the first time, I went in fear. I had a horrible time. The second time, I went trusting and with the firm decision to enjoy it!! I had the best time!! There is danger everywhere… one need to be cautious but not fearsome!!! Hi, I’m from Mexico and I’m happy for the wonderful experience they have had in my country. First of all, for many Americans, Mexico is a very underrated, not all but a majority may believe that my brother did an exchange year in Ohio and people with doctoral degrees were able to ask my brother if in Mexico there were cars or donkeys, whether there were burgers, that if there was a Coca Cola, etc., things like that. They can not believe that we have shops or issues that humanity now make life with little easier. They believe that live in extreme poverty, or they get the idea that Mexico is like some border cities like Tijuana or Ciudad Juarez. As you say, we are not America but we have our own development according to our means, we do not spend what we have, save to buy a car, or if we have a job and let us buy our homes with credits and such things . There are many Mexicos, rich, poor, beautiful, ugly, etc. I do not know why the media have been commissioned to discredit thus spend only talking about violence, violence, violence, and what we see in certain parts of the country, we know that there is a problem but try to get ahead. Mexico has about 2 million square kilometers, is a fairly large country and distances are long. Of the 32 states each has different realities, some safer than others. Especially the problem lies in parts of north and one other isolated places, but as you mention, all over the world have their dangerous cities is knowing where to go. For examples Detroit, St. Louis, Miami, Cleveland, Washington, DC. some cities are dangerous, so I do not plan to travel to the U.S. for fear something happens to me. Differences often do not know these parts of the country, and say that something happened in Mexico, they think it’s across the country. I live in the state of Yucatan and is the safest in Mexico, many people live here from other parts of Mexico and abroad as Americans and Europeans. The tourism industry provides a lot of work to the country and must be maintained. I saw your videos from across the border, and had no problem, just a sense of caution and know what time to go and which places no. I am proud of what my country offers, and people like you raise awareness of the reality. I think few countries in the world can offer so much, and is known only to certain parts of the country, it would take much to know everything, beaches, colonial cities, modernity (believe it or not, as is modern Mexico), culture, quality of life, etc.. Particularly issues such as food and landscapes fascinate me, here you find from deserts, jungles, forests, lagoons, mangroves, reefs, mountains, rivers, etc.. The economy has improved and we move forward, we have problems, like all countries, but however I think the country’s wealth lies in the good people of the country that improve every day. You have to live one’s own reality, like me, that Americans sympathized me much, but everyone I’ve met have been excellent people, we should not generalize and live one of their own experiences. I appreciate the opportunity to share their experiences. Viva Mexico. I agree with you, thanks for sharing your perspective and insight! Thanks for your help on Twitter today. I read your blog most nights before bed on my iPad. I’m usually too tired to comment but it’s a goal to get more active interacting! I love the milk comment. We just returned from Costa Rica and while we were there my son turned one. I tried to give him some of that boxed milk and he threw the bottle. I was a little worried he would have a hard time transitioning to milk but once we got home he sucked down the Horizon Organic real milk. Same with baby food…it had sugar in it there. He learned to love his finger foods of meat, veggies and fruits there which was perfect. I miss all the fresh food already and it cuts down on grocery bills not buying all the boxed and processed stuff. So we are planning to live in CR for 6 months and possibly drive down…your site is a great resource. Thanks for commenting. I also love the ‘real’ foods! Too much processed junk is making it’s way around the world though. Costa Rica is a great place to live! We loved it. ahhhh, I want to go to Mexico now. I grew up in Texas, and my parents never took me there because they thought it was too dangerous, lol. I agree with your comment on poverty. I live in Thailand now, and many people look at these people at poor. They are not starving. Go to Africa if you want to see people starving. They have roofs over their heads even if the homes are held built. And they all have small businesses out of their homes. That’s a blessing, something Americans can’t do because of city codes. That is true. Lot’s of regulations in the U.S.A. I just came across your amazing blog because I’m planning to visit Mexico. It’s so inspiring and full of useful information. Thank you very much for this! and congratulations for your life and family! johnscherber Good for you, there are so many wonderful things about Mexico.